This is a joint project between a group of flashlight enthusiasts at BudgetLightForum.com and budget friendly flashlight maker Thorfire. 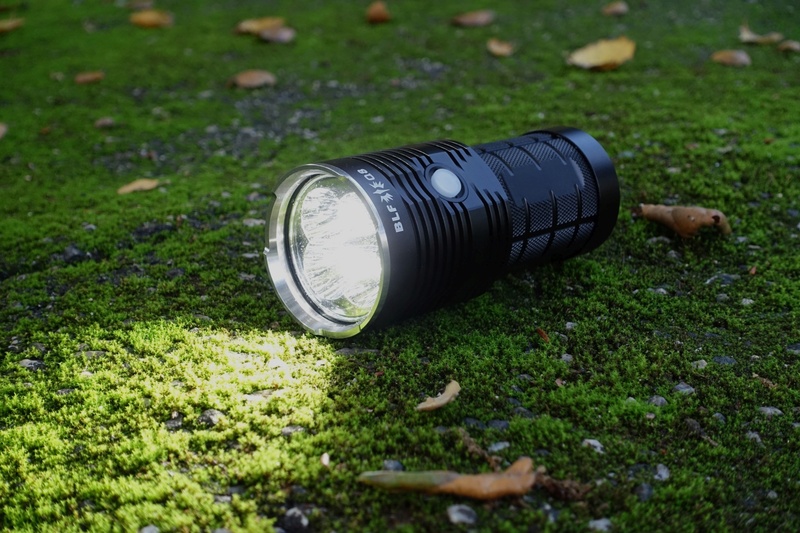 If you are looking for a high quality but super affordable “soda can” light with ramping brightness, then say hello to the 5,000+ lumen Thorfire BLF Q8! As a flashlight enthusiast this is an amazing find! You get amazing output, great beam tint and profile, a pretty green back-light side switch, and lots and lots and lots of UI choices, including a super innovative infinite brightness ramping. Also for flashlight “modders” this light is designed to be easily taken apart. The main draw back is related to the complex UI which can be easily messed-up if you don’t read the manual a few times. The UI has both “ramping” which uses a press and hold to change brightness, but the “mode” outputs (typical LOW MID HIGH etc) but uses clicks to change brightness instead, so the light is a bit bipolar. There is only one version but there may be factory updates in additional production batches. Current price, at time of writing, is about $75 USD but you might be able to find a steal at around $40 (buy links at the very end of the review). My favorite feature is the green indicator side switch. Overall, this is a very sturdy light and I love the deep-cut diamond knurling. I really like how the anti roll is reverse curves instead of a hex pattern. The flat spot around the button really helps with orientation as well. The steel bezel is a beast. Wish there was a lanyard loop. The overall length is nice and short but the index finger has to grip around the larger head feels a bit uncomfortable after a while. The light is easy to open up and surprisingly the tail cap is removable for modding or stowing the UI cheat-sheet in there. Head circuitry is also accessible via a couple of philips screws. The contacts are gold-plated and very sturdy. I’ve heard that you may get a lumen boost if you replace the stock tail cap screws with brass ones. It’s worth mentioning that the LEDs are connected to an “integrated shelf” which which allows the head to more effectively dissipate heat. The center has a pretty warm center with a bit more neutral tint on the spill. 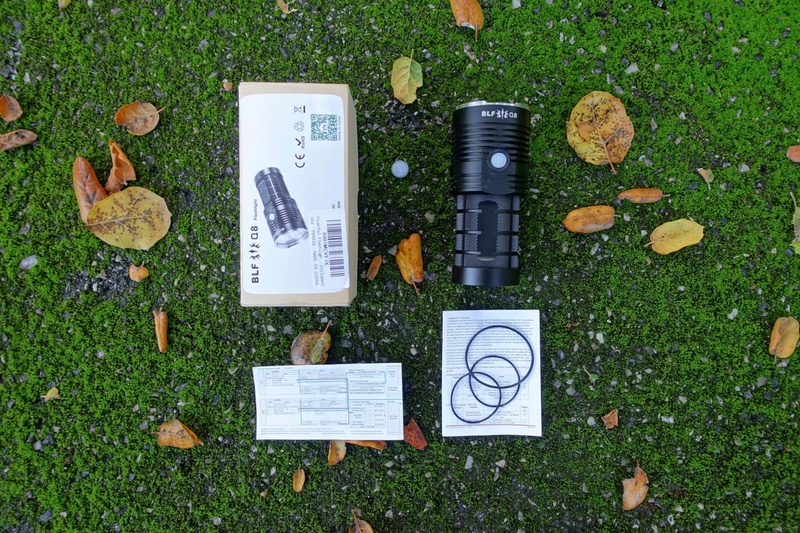 Below is a comparrison of teh BLF Q8 (left) with Nicha 219B (right) (in the Nitecore MT06MD penlight). The main spot is pretty tight with a 15 total degree spot; the main spill is about 90 total degrees, but due to crenelated bezel it gets limited to 70 degrees in certain areas. 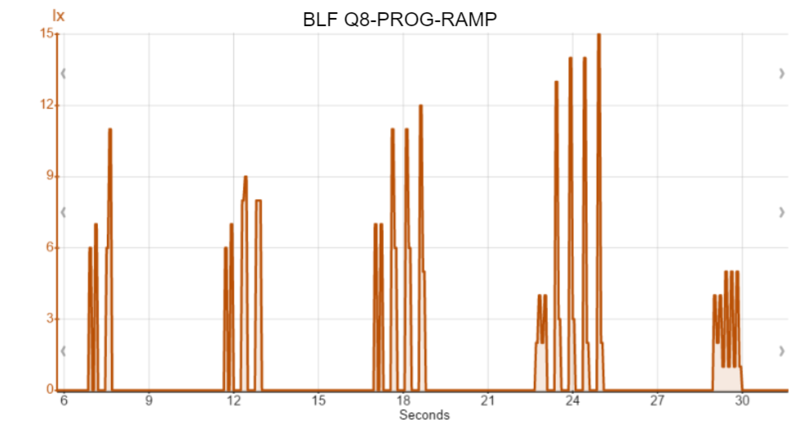 Ramping changes output every 0.1 second. It take a total of 2.25 seconds to ramp from 0 to full. Ramping is nonlinear. There are plenty of mode set options which I’m sure will satisfy pretty much everyone. No batteries are provided but I’m not complaining, this package is an amazing deal. However, there are not completely clear recommendations on batteries for the light by Thorfire. The only guidance they give is that “button-top” style is highly recommended because the of the circular anode contact (which makes it easier to having them all in parallel). Thanks to BLF members testing out for testing out different batteries and measuring outputs (table below). The light has very neat green illuminated side-switch. The switch, among other functions, can indicate battery life and low voltage warnings. At any time, you can use the UI to check the (average) battery voltage and the light will blink (both the primary led and the switch led) out the voltage. Also, when the voltage is very low the light will blink 3 times pause and blink 3 times again. There is built-in low voltage protection (LVP) and the manual says it’s between 3.0v and 2.8v, and when I tried draining it fully the light would shut of at 2.9v. I measured the light output in relative LUX and I have not spent time yet to calibrate for lumens or factored % of max output. The charts I’ve provided, while are literally quantitative, I suggest using as a qualitative reference for how the output may behave over time; typically lights aren’t left on this long and the max output can be reset. It’s worth noting that usually the advertised runtimes for the highest modes are calculated based on frequently resetting the mode back into the highest position possible, which I don’t really have time to replicate. PWM check using a 50 millisecond test period with a sampling rate of 3,000 times per second. For special modes I use a 150 millisecond test with sample rate of x. Temperature measurement condition is at room temp and currently under no fan cooling. The below batteries were recommended by BLF members and purchased by me separately. Make sure that you carefully research any cell you are considering using before purchasing. The default setting for turbo is a 3 min timed step-down which is exactly what happened. The turbo can be reset after the timed step-down, as shown in the second chart, but I’m not sure if there is eventually a temperature cap, my guess is no. There appears to be no significant PWM on any constant mode other than the programmable firefly mode. Below is a chart of the light somewhere below 160 lumen mark. For comparison, the second graph shows PWM of the Nitecore R25 flashlight which varies from 0 to 120 lx on the LOW mode. I measured the standard strobe frequency is about 18.2hz. The second chart shows the second more tactical strobe which varies. 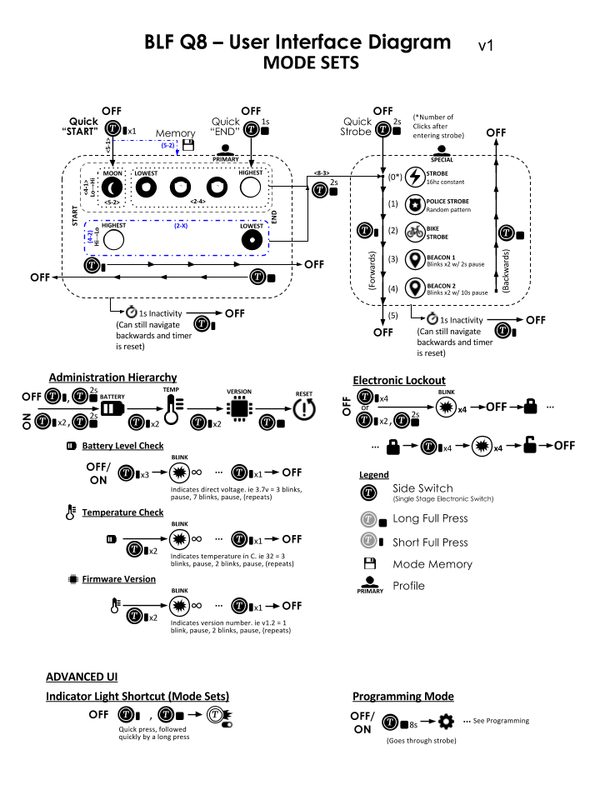 Below are charts for the other blinking modes. Note, as the test time increases the sample rate decreases. Note that the bike strobe stays on at a low mode between blinks. Note that the both of the locator beacon modes actually flash twice between their pauses. A max temp of 124.1°F was observed for TURBO. There is a way to program the light to be limited to a temperature but it is all by feel to your own hand; ie you can’t program an exact temperature value. 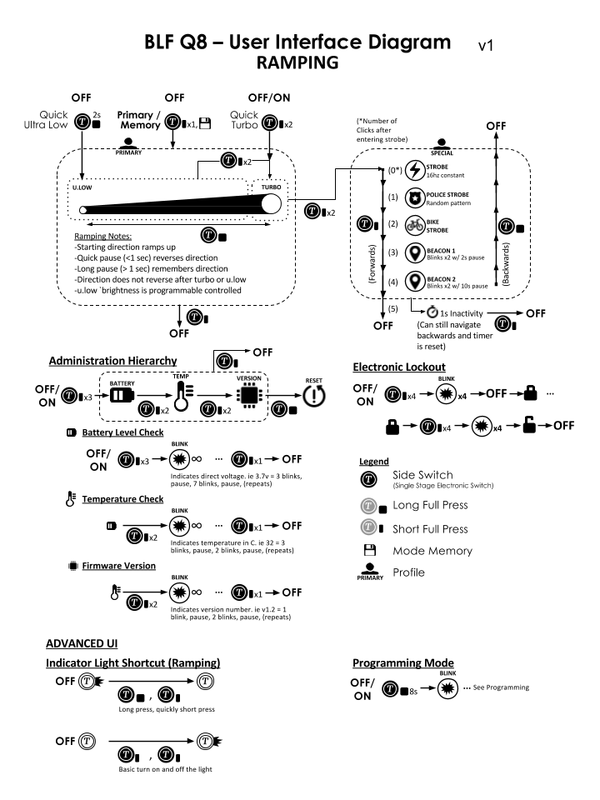 The chart below if for the default 3 min step-down setting. Overall, love the ramping version of the UI; however, it’s pretty easy to mess up settings by accident plus the “mode sets” UI is a very different UI so you basically have to learn 2 flashlights in one. Mode Sets – really need a different way to settings area WITHOUT GOING THROUGH STROBE! Temperature – add setting that would set max temperature to a specific given number ie click once for 100° F, twice for 110° F, three for 120° F, etc. OK so if you know my work, I like to make UI diagrams and I’m crazy enough to give this one a try. I’ve probably spent over 5 hours just working on this part of the review alone. After all is said and done I sure hope this actually helps you make sense of this bi-polar light. I’ve done the main UI for both ramping and mode sets, but what I didn’t do was all the settings part but once you understand what all the blinking lights mean it’s easy enough to follow the included manual. There are defiantly quirks to the UI (like how the strobes to go in a circular cycle) but I’m probably not going to describe or show them all. Regarding the settings (aka programming) area, once you enter this area, the main LED will blink twice fast then blink out the setting number you can program, ie 2 fast blinks with 1 blink after is setting #1 “ramping function”. Once it blinks out the setting number, you have 3.5 seconds to click the switch to change the setting or you can leave it alone and let it go to the next setting number. After it has gone through all the settings it will blink 5 times very fast and turn off the light. Below is chart which shows the blink pattern for ramping settings. Tip, you can advance to the next setting by longpress, and if you to a really long press it will exit the settings area and turn off the light. I have also noticed that both ramping and mode set settings are saved separately no matter which one you are currently in. For instance by default, mode sets does not have mode memory, I switched from ramping to mode sets, changed the setting, went back to ramping, then back to mode sets, and it still had mode memory. Also, the settings are saved even if you take the batteries out. Excellent review! Really an amazing light for the price. If you are looking for something remarkably bright on a budget, this is it. Even at the $75 full retail price, it’s still a great flashlight with a lot of features. The beauty of the UI is that it’s as simple or advanced as you want it to be. It’s blown away pretty much everyone I’ve showed it to. Thanks for the comment! Yeah this light is an excellent find! Only minor sore spot I have is there is no lanyard so I’m afraid of dropping it but I suppose one could utilize the quarter inch thread and rig a mini d loop for a lanyard connection.